Every 14 days another language dies. Most are languages we have never heard of, in faraway lands. But some are closer than we may think. National Geographic’s Enduring Voices Project (with the Living Tongues Institute for Endangered Languages) has identified six places on earth that possess the highest diversity of native languages with the greatest threat of extinction. British Columbia is code red among these endangered language hotspots, threat level SEVERE. I work with global languages every day, yet until now I had no idea that my own province was the ancestral home to 32 distinct native languages which have flourished here for millennia. But it’s like I’ve discovered the greatest bookstore in the world on the day before it goes out of business: all of B.C.’s surviving aboriginal languages, from Carrier to Beaver to Coast Salish to Squamish, are facing mass extinction. 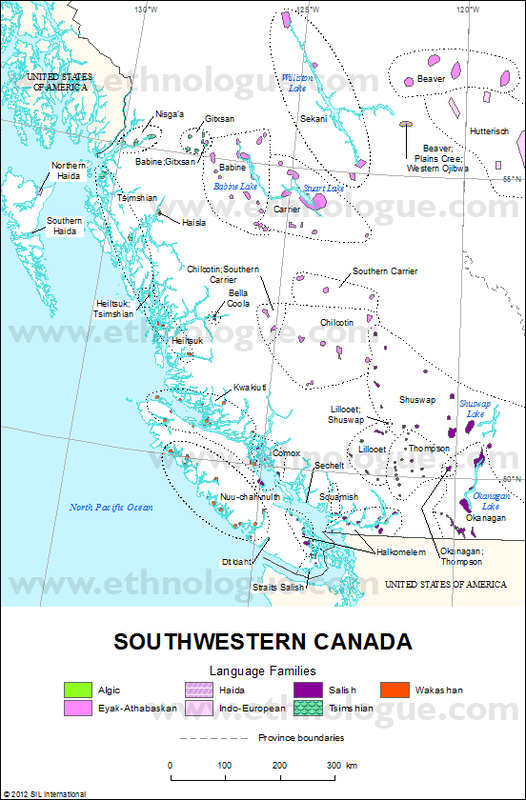 The map below from the Ethnologue shows the distribution of languages in B.C. At this writing, except for Pentlatch, Sooke, Songish, Semiahmoo, Comox, Nicola and Tsetsaut, all have at least one mother tongue speaker left alive. There is much talk today of preserving biodiversity. But what about linguistic diversity? The 7000-plus languages on this planet are dying out at an alarming rate. UNESCO predicts that by the end of this century, half of the languages on earth will be extinct. In fact, the Alliance for Linguistic Diversity says that 40 percent of all languages are already endangered. These estimates are ravingly optimistic compared to what is coming out of the Hungarian Academy of Sciences. A paper published in PLOS One entitled “Digital Language Death”, predicts a 95 percent die-off of the world’s languages. British Columbia is one of the most tragic examples of language extinction because it is home to such a rich, and rare, cluster of languages. First of all, there is the sheer number of languages in a local First Nations community of only around 200,000 people. Across Canada, from east to west, north to south, there are a total of 53 native languages. Sixty percent of these are found in just one province: B.C. Add to this unique ecosystem the fact that the 32 surviving local languages represent seven distinct families (as well as two so-called ‘isolates’, Haida and Kootenay). There are only 10 distinct language families in all of Canada. If you consider that English, Russian and Hindi all come from the same language family, you get an idea of how much language diversity in British Columbia will be lost when those languages go. Which they will, if we do nothing. Lacking a concerted effort to save them, when the last speakers of these languages die, so will their languages. While we may fight to preserve rich pockets of biodiversity, such as the Amazon rainforest and the Galapagos, we have one of the world’s richest seams of linguistic diversity in our own backyard. If we let those languages go, they’ll be gone forever. Ironically, new studies suggest that language loss has a negative impact on biodiversity preservation. That’s just one of the reasons why language death should matter to us. Click here to read more reasons why you should care. It is good to celebrate International Mother-Tongue day. But in Canada mother-tongues, other than English and French, are being neglected. All over English Canada, French is taught as a second language generally for 4 years at elementary schools. Most of English Canada has no French speaking people. So what is the use of teaching students French for 4 years if they can’t practice speaking it. They don’t become English-French bilinguals. I think huge amount of money being spent on teaching French only for 4 years at elementary schools is a mostly wastage of resources. If French has to be taught as Canada’s official language it should be taught from grade 1-12, otherwise students should be taught their mother-tongues so that they can communicate with their families and communities? I understand it is only possible to offer students’ mother tongues if there are sufficient number of students to form a class. In Surrey,BC, in some elementary schools, up to 90% of students are from Punjabi-speaking families, but they are offered French as a second language, not Punjabi. Only 3 out of 100 elementary schools in Surrey are offering Punjabi classes. You can visit http://www.PunjabiTutor.com/Punjabi to see how widely Punjabi is spoken in Canada.